My maternal great-grandmother, Paralee Nunley Green was never one to wear bright colors or to be in the spotlight and this happened to be one of the lighter colored dresses she would wear. She was always pulling at her dresses. She didn't like to show even a sign of her leg not even her shin. She lived in what we called the big house with my Granny Mae and Daddy Carl and we lived there for a short time too. She had a separate part of the house and one would have to knock on her door to be received. She would sometimes invite me in for the afternoon and she always offered me peppermint hard candy which was her favorite. We would wile away the time watching her stories as she called them. Her room was full of huge cedar furniture. I always felt special in her presence. She was a formidable woman. To this day, although it doesn't happen often, the smell of cedar and peppermint simultaneously conjures up the lady in the long sleeved dresses. This very plain long sleeved dress is something she would have worn in the summertime. She wore this dress in the 1940's and 1950’s I am told. Granny Mae gave me this piece from her mother in 1993 as I had just started doing these miniatures. This is one of the garments she had kept of her mothers and it meant a lot to her. 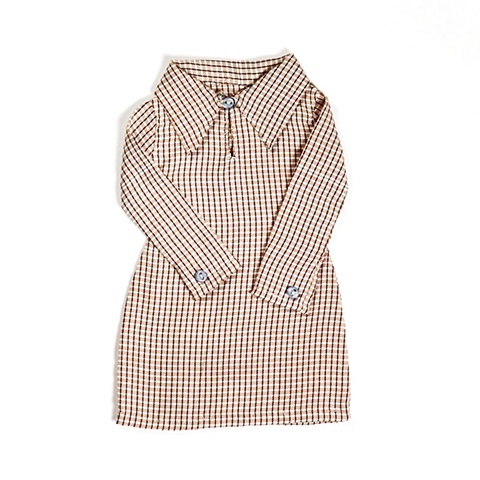 It is made of 100% cotton in a tattersall pattern which was typical of her day.